Here’s a tool to guide your association’s consideration of where improvement is most needed. An association’s financial and operational strength is important to at least three groups. Current owners want their investment to be supported by strong management of financials and the property. Potential purchasers of condominium units want to be assured that they are making a solid investment and surprise special assessments will be avoided. The association wants to have a reputation that results in favorable treatment by financial institutions and others. But how can an association’s financial and operational health be evaluated? The Alliance for Bayway Communities1 (ABC) developed descriptions of and a “grading system” for management processes and practices that associations traditionally use and the results they normally expect to achieve. The “ABC Checklist” is based on the experience of association leaders in the ABC and feedback from the property management companies active in our area2. As such, it is a practical guide for association management best practices. The ABC Checklist can be used to evaluate an association’s overall approach. We believe its first use should be self-improvement, where associations and their prop-erty management companies evaluate their practices and then act to address areas that need improvement. These responsibilities can be assigned to the property management company, board, committees, or combinations thereof. Distribution of responsibilities is an association choice and depends on the level of interest and background of association members, but all must be clearly defined and assigned. The results categories provide an indication of how the overall system is working. For each of the 12 practices and results categories, four levels of association performance have been defined. The highest level represents best practices or highly desirable results; the lowest of the four levels describes a condition where improvement is needed. It is not possible for all of the 48 performance levels to be included in this article, but the full ABC Checklist is posted on the ABC website, www.baywayalliance.org, and the FLCAJ website, www.fcapgroup.com. To aid in understanding each of the categories, descriptions below mention the highest performance level in each area. An association satisfying all criteria at this level would be doing very well indeed! In select cases, this article describes the lowest performance level to illustrate the range of performance covered in the ratings. 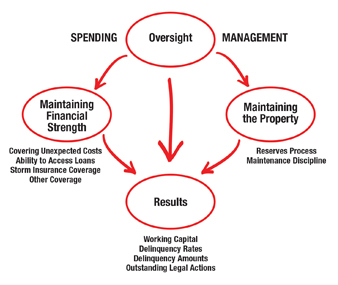 Management oversight: The property manager (PM) must have sufficient time to resolve conflicts, ensure rules and regulations are followed, and make sure the board’s expectations are met. Also vital is time for the PM to define and address the most important prop-erty improvement needs and to prepare for future changes outside the association’s control. A best practice would be for the PM (with at least a CAM certification) to have ten or more hours per week for each 50 units in the association. An association that has no appropriately trained PM, has no defined PM hourly commitment, or has no documentation of the PM’s duties and deliverables would be at this category’s bottom performance level. Spending oversight: This component focuses on whether all spending is carefully reviewed and the degree to which association finances are reported to owners. Best practices include monthly review of all expenditures by two individuals (e.g., the PM and association treasurer) as well as an annual review providing owners with details of the past year’s financial performance and a forecast of developments that will have a material impact on the association. All required reviews/audits must be done on schedule and deficiencies immediately corrected. Covering unexpected losses: The association should be prepared to cover significant unplanned expenses, such as immediately boarding up broken windows and drying out areas affected by water penetration after a major storm. There are two approaches that can satisfy this component. First, funds may be set aside in a separate account (not the normal cash account discussed under Results below) to cover such costs. The second approach is to have a line of credit in place that can be quickly accessed for the same purposes. The best practice amount of the set-aside funding or line of credit is $1,000 per unit. Ability to access loans: If association common property is substantially damaged and not covered by insurance, a major loan may be required. An association should have confidence that they can arrange a bank loan for at least five percent of the assessed property value at a favorable rate. This confidence should be based on a documented review of their specific case with a commercial bank. Storm insurance coverage: The best practice for an association’s policy for major storm coverage (often referred to as wind damage coverage) is a three percent deductible which is per year instead of per event. That is, the deductible amount would only apply once during an entire coverage year regardless of the number of storms affecting the property. Newer buildings may be able to secure wind damage coverage with a deductible lower than three percent. Other insurance coverage: The association must have flood insurance covering all common areas in all buildings. Further, additional policies must address all major liability concerns including board and overall association liability, workman’s compensation coverage, and an umbrella policy to assure owners that potential losses beyond basic policy limits will be covered. Reserves process: The best practice for an association’s reserve plan has two requirements. The first is that future expenditures in the reserves plan have been fully reviewed and confirmed by certified external experts within the past five years. Secondly, this plan must be fully-funded. For associations using the pooled method, the current 30-year plan (with expenditures at current cost) must have positive funds in the reserves account for the entire period with level funding (i.e., no need for increases in the annual reserves contribution). Similarly, for the itemized method, funds must be currently available for all identified expenditures at their current cost in proportion to their expended life. Maintenance discipline: A documented preventative maintenance program must be in place and external audits of site maintenance needs must take place annually. This best practice requires that the maintenance plan and audits be made by external facility maintenance specialists with appropriate background and training. A “fix things when they break” approach would be the lowest performance level in this category. Working capital: Accountants experienced with association financial matters recommend the normal operating cash account (excluding owner pre-paid monthly fees) be kept at or above two months’ operations spending. The cash account and operations spending amounts should not include funds dedicated to the association reserves account or set aside for payment of future insurance premiums. This best practice is necessary to avoid insufficient funds during months when quarterly or semi-ann-ual bills must be paid or other peaks in spending occur. Delinquency rates: This is a key factor banks will consider if an association needs a loan. The expectation for a well-managed association is that the number of owners delinquent more than 60 days is less than two percent of all units. Delinquency amounts: In addition to the number of delinquent units, an association’s creditworthiness is affected by the amount owed by such owners. The expectation here is that the total amount owed is less than two percent of the overall annual budget. Outstanding legal actions: The expectation is that early and effective management of conflicts between owners, rules and regulations violations, and financial disputes will result in no outstanding formal legal actions. In the spirit of continuous improvement and working either on their own or with their property management company, associations can use the ABC Checklist to improve their financial and operational practices. As noted earlier, it is available on the ABC and FLCAJ websites and will be updated as feedback from using the checklist is received. Give it a try for your association and let us know how it can be improved! A more formal, widely-accepted, and public way to rate an association’s financial and operational strength could develop from this initial work. As noted earlier, the practices and expectations in the ABC Checklist come from the practical knowledge of people serving on association boards. Our hope is that this article will encourage others with more specialized knowledge (in real estate, accounting, banking, property management, or other areas) to consider this next step. A formal system would benefit all three stakeholders … current owners, potential purchasers, and the association … and would ultimately result in appropriate recognition for well-managed associations. 1 The ABC consists of 48 associations with about 10,000 residents in the Pinellas Bayway area of St. Petersburg. It holds seminars on topics of importance to association leaders and provides an advocacy voice for the area with city, county, and state officials. 2 The four property management companies are FirstService Residential, Resource Property Management, Condominium Associates, and Professional Bayway Management. Bill Blazowski was a seven-year member of the Bacopa Bay Owners Association Board and is co-founder of the Alliance for Bayway Communities.